These soft old-fashioned style donuts a perfectly tender and bursting with the flavors of fall. Pumpkin and traditional fall spices go perfectly with a warm cup of coffee or tea on a cool, crisp morning. 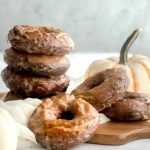 Pumpkin Spice Old-Fashioned Donuts are perfectly tender and bursting with the flavors of fall. Pumpkin and traditional fall spices go perfectly with a warm cup of coffee or tea on a cool, crisp morning. There’s something I really need to confess something, just to get it out of the way. I really don’t like fall, and I really don’t like pumpkin. I KNOW. Pretty much an autumnal Scrooge. Winter I can get behind because CHRISTMAS (+ my birthday). Spring comes around and everything is reborn and beautiful, and summer is for pool days, gardens, and sun tans. But when it comes to fall, I just find it all vaguely depressing. The green things die. The skies get overcast. I have to pack away my sunny summer dresses and pull out the sweaters and boots. Until these donuts. Ugh. They are SO good. I almost didn’t make them because I simply don’t eat anything pumpkin, but the idea had crept into my brain and wouldn’t leave. Plus, it’s a donut. The moral of this story is that if you fry something and then dunk it in sugar, it becomes far more enjoyable. Especially when it yields a donut with a perfectly crackley, textured outside that is perfect for catching and holding the glaze, with a crumb that’s perfectly dense and moist yet still tender and soft. So, all of that to say, these have convinced me to give pumpkin a chance. I won’t be ordering a PSL any time soon, but you had better believe that I will be eating my fair share of pumpkin spice donuts. In a medium sized mixing bowl, sift together the cake flour, baking powder, salt, and spices. In a different bowl, use a hand mixer to cream together the melted butter and sugar until crumbly. Add in the egg yolks and vanilla and beat until smooth. Next, mix in the sour cream and pumpkin until well combined. Add a third of the flour mixture to the wet ingredients and mix on medium speed until combined. Repeat with the rest of the flour, and mix on medium-high until all of the flour has been absorbed and the dough is smooth. Using a rubber spatula or large spoon, move the dough to a sheet of plastic wrap. Wrap it well and refrigerate for at least two hours, or up to 24. Remove the dough from the fridge and, on a lightly floured surface, roll the dough out to 1/2” thick. You don’t want it to be too thin, or they won’t puff up to the correct thickness when you’re frying them. Use a large round cutter (I actually like to use a wide mouth jar lid), cut out as many circle as you can. Take a small round cutter, about 1”, and cut out the centers. Set them aside, then press the edges of the dough into a ball and repeat the rolling and cutting process. You may need to do this several times to use all of the dough. To fry the donuts, pour about 3 inches of your frying oil into a deep pan. Heat it over medium heat (you will need to adjust based on the size and intensity of your burners) until it reaches 350°. Carefully drop 2-3 donuts in and let them fry until they have browned on the first side, about 2-3 minutes. Flip them with a metal slotted spoon or tongs and allow the other side to cook as well, then remove them to a tray lined with paper towels. While the donuts are cooling, warm the milk and vanilla extract in a small pan. Sift in the 2 cups of powdered sugar and whisk until smooth. Remove the glaze from the heat and, using a fork, dip each donut and flip until they are all covered in the glaze. You may have to tip the pan and turn the donuts some to cover all of the sides. Allow The glaze to harden for about five minutes. Store the donuts in an airtight container. When frying donuts, you need to keep the oil between 350° and 375°. If it drops below 350°, the donuts will take longer to fry completely and will absorb more oil, making them greasy and heavy. If it get much above 375°, the outside of the donut will likely burn before the inside is cooked, leaving you with doughy, nasty donuts. And speaking of temperatures…I only ever fry 2-3 donuts at a time. When you drop a cool, or even room temperature donut into hot oil, it brings down the temperature of said oil. Do it several times and you will seriously affect the temp, which means you’re not controlling it, and as we learned above WE NEED TO CONTROL THE TEMP. Sorry, my inner control freak gets out occasionally. Heating the milk for the glaze makes it set much faster and develop a nice, shattering crust. It’s not necessary, but it shortens the wait between you and eating when the glaze is staying drippy and wet.